Watch These Videos BEFORE you order from the New Catalog! Stampin’ Up! just released several videos and I think you should watch these videos BEFORE you order from the New Catalog tomorrow. Online ordering will be shut down from approx. midnight tonight until about noon June 1st (CST) to change over the catalogs and item codes. So while you’re waiting, watch these videos! I think the next Bundle is going to be a big hit. I would order yours right away because I suspect this might be a sell-out! A couple of new products need to be seen to be appreciated. You may have overlooked these items but I’m sure you won’t now that you see how awesome they are! Everyone needs paper, and this year the choices of Designer Series Paper is just over the top delicous! Overwhelmed? Don’t know where to start? Kits are great places to start, AND they make great gifts too! Whew! Binge watching Stampin’ Up! beats Netflix any day, doesn’t it? Don’t forget that there is a promotion going on until June 10th for Paper Pumpkin craft kits too. 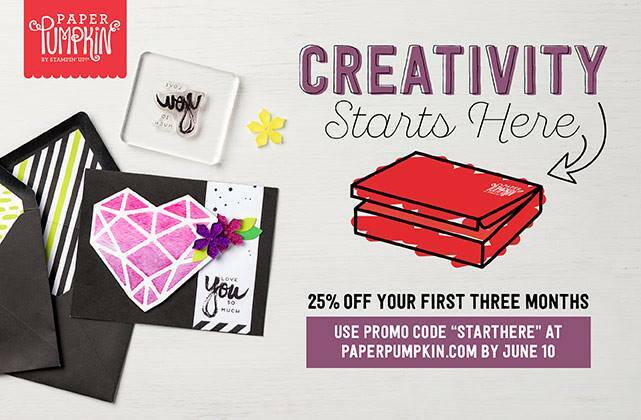 New subscribers save 25% on June, July & August kits when you subscribe by June 10th and use the promo code, STARTHERE, at PaperPumpkin.com to subscribe. Ready to shop? Join my Live on Facebook for my New Catalog Launch Party at 7PM (EST) Thursday, June 1st for fun, games & prizes AND shopping. Or just click here to start shopping and please use Host Code 2HH3XWVE when placing your order!